Anyone who intends to work directly with kids in healthcare field should join PALS certification program. This program is created by American Academy of Pediatrics and American Heart Association to help health care professionals in treating and assessing pediatric patients. The program is designed to help healthcare providers streamline the care and treatment of children so as to ensure that providers have all the skills and training they need to deal with injuries in children who require critical care. 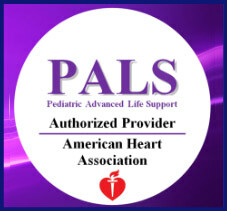 PALS is the acronym for Pediatric Advanced Life Support. It is a program that is developed by American Academy of Pediatrics and American Heart Association to equip healthcare providers with skills required to treat infants and children who are suffering from critical conditions or injury. People who want to do this program can do an online course or attend two day class that is available in most hospitals. This program teaches healthcare providers how to respond to critical situations. One of the things that students of this program learn is child CPR and the proper use of defibrillator. Students of the program are trained to safely help infants and children who need critical care. Medical personal that don’t have experience working with children and infants can just this program to learn how to treat children. The skills they learn can be applied when they work with infants and children. You can earn your PALS certification today by completing an online course or by attending 2-day classes that is offered by several hospitals and medical schools. Students who are a part of this program participant in several standard scenarios and they are graded based on the ability to apply their knowledge to these situations. To pass the course and receive certification, they must demonstrate their ability to deal with critical care procedures. When you have successfully completed your course, your information is processed and you will receive a certification card. This card is a proof that you have completed the required number of hours and have passed your final exam. This certification is valid for two years. At the end of 2 years, certified individuals must take a refresher course and pass an exam. PALS certification program can help health care employees like pediatricians, nurses and physicians that are involved in administering healthcare to infants and children. However, this course is not limited to healthcare professionals as even people who not have medical knowledge can complete this program. « Can thin people have high cholesterol?